LAWRENCE — The University of Kansas School of Law’s Legal Aid Clinic received a Pro Bono Award from the Kansas Bar Association at the annual Kansas Bar Foundation recognition ceremony and dinner last month in Overland Park. Legal Aid Clinic Director Melanie DeRousse said the clinic was nominated for the award based on its work last fall to provide free legal assistance to individuals eligible to renew their Deferred Action for Childhood Arrivals (DACA) authorization. DeRousse said the students got to practice a variety of legal skills through their volunteer work with the DACA clinic, such as client counseling, interviewing clients about difficult issues, learning to be precise and meticulous when filling out forms for the federal government and understanding the need for lawyers to be able to respond to emergency justice needs in the community. “It’s a really wonderful feeling to know that we are part of something so big and that we were able to pivot and respond to an immediate legal need with just the resources in this building and the energy of the students and faculty who volunteered,” DeRousse said. A civil practice that may include protection from abuse, consumer advocacy, juvenile rights and other matters. The KU School of Law encourages all students to make a commitment to pro bono service as part of their professional lives. Twenty-nine KU Law students contributed more than 3,373 hours of free legal services over the past year, earning a spot on KU Law’s Pro Bono Honor Roll. Pro bono work is defined as uncompensated, law-related work that benefits the public, such as through a nonprofit organization or government agency. Students prepared tax returns for low-income residents, represented the interests of children as court-appointed special advocates, helped clients expunge past criminal convictions and prepared guardianship petitions for families seeking to secure their adult children’s futures. 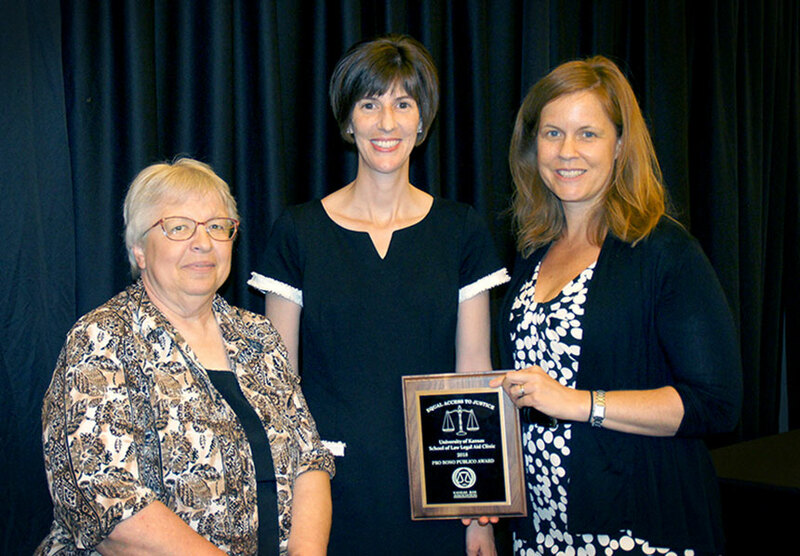 Photo: Barb Wrigley, Meredith Schnug and Melanie DeRousse accept a KBA Pro Bono Award.